Before telling you about this Poblano and Vegan Bacon Green Bean Skillet Casserole we gotta go to that good ol' disclaimer: Housevegan.com is a participant in the Amazon Services LLC Associates Program, an affiliate advertising program designed to provide a means for sites to earn advertising fees by advertising and linking to Amazon.com. This post contains Amazon affiliate links. Once upon a time I signed up for Vegan Mofo 2016, and then promptly forgot to prepare for it. I was totally Halloween focussed, and I am who I am, you guys. However, I did spend all of last week/this weekend getting my booty in gear, and I'm thrilled to say that I have lots and lots of posts lined up. While I may not win at Mofo this month, House Vegan will definitely be a fun stop on your blog roll. So long story short (too late), Hi Vegan Mofoians! This month I'll be focussed on Thanksgiving inspired recipes, products, and ideas to help keep the holiday easy and delicious. 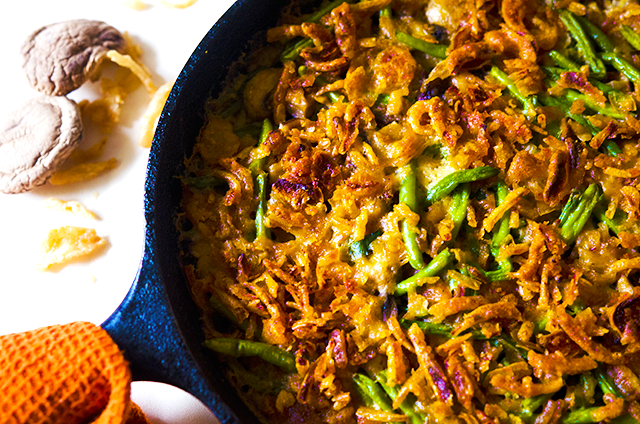 What better Thanksgiving recipe to start with than the often misunderstood and underestimated green bean casserole? 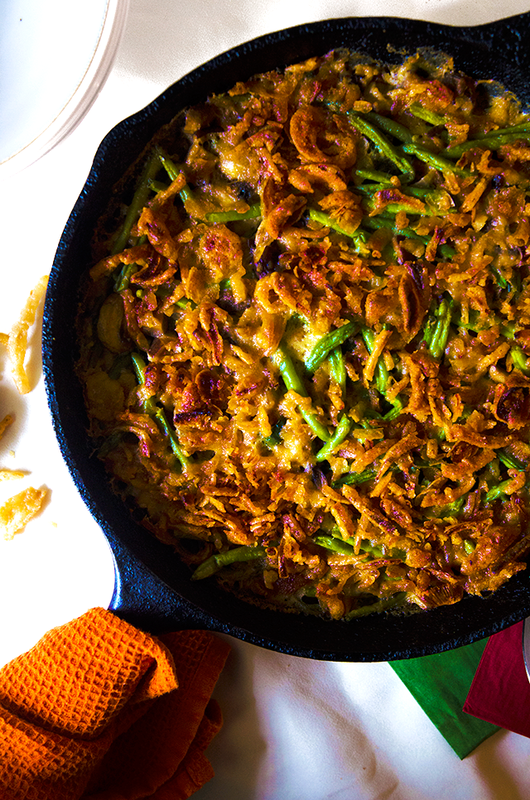 My Poblano and Vegan Bacon Green Bean Skillet Casserole is not just a side dish to take up space on your plate and table. This recipe is so good that my husband and I have been eating it by itself for lunch and dinner. 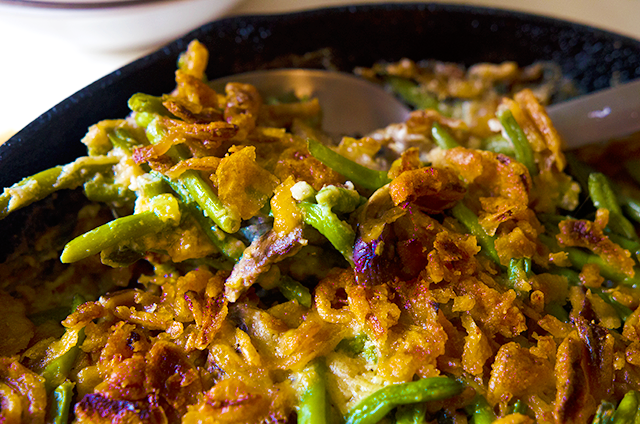 That's right, this vegan green bean casserole can carry a meal as well as contribute as a truly excellent side dish. I've always loved green bean casserole, but I think I may be one of the weirdos. My family always made the classic Campbell's recipe so when writing my own I knew I wanted it to have the same structure, but with a few flavorful changes. The biggest change isn't with the poblano and vegan bacon. These were simple additions to elevate the dish, and bring new flavors to the table. It isn't that it's baked in a skillet either. I use a skillet because skillet cooking is the easiest in my opinion, and I like the large surface area for maximum browning. The aspect of this dish that makes it so stellar and so perfect is the homemade Japanese-inspired vegan cream of mushroom soup. It may sound a little strange, but the Asian ingredients give the bulk of this dish a depth that is not recognizable, but is totally noticeable. This is a truly comforting casserole that people will love to eat. It's deep and rich, and creamy yet crunchy. It's incredible. No one is going to be able to pull out those Japanese ingredients, but they will be able to tell that this dish is well-rounded in flavor. Thanksgiving as a holiday has a lot of issues, and as the US election approaches (tomorrow!) I've been extra aware of that. I like to think of the holiday in its modern form: a celebration of family, friends, and thankfulness. To many, Thanksgiving means stress and turkey and overall wonkiness, but it doesn't have to be that way. Thanksgiving is still in the fall which means it is under my jurisdiction. That means that with a little planning and excitement it can be a wonderful and low-stress holiday. November 24th seems so soon, but you have plenty of time to get it together! First, did you catch my post on How to Have the Best Vegan Fall Ever? Check it out stat. In that post I give you the basic plan outlined in my book, Fall FoMo No More. You're only a few lists away from your best fall yet, and despite what retailers are telling you, fall isn't over. Second, keep coming back here for more Thanksgiving inspired fun, recipes, and more! 1. Preheat your oven to 350ºF. Place the shiitake mushroom caps in a heat proof dish with the hot water, and allow them to soak for 20 minutes. Meanwhile prepare the cashew cream. 2. Grind the cashews into a soft powder using a nut or clean coffee grinder. Be careful not to get overzealous, or you’ll find yourself with cashew butter. Add the cashew powder, and remaining water to a small sauce pan over medium heat. Whisk the mixture continuously until it begins to thicken. Once the mixture reaches a thick sauce consistency remove it from the heat. 3. Once the shiitake mushrooms have soaked for 20 minutes, remove them from the hot water (now called dashi), and roughly chop them into small pieces. Set the mushrooms aside for now. 4. Melt the vegan butter in a saucepan over medium heat. Add the flour, and whisk the mixture to combine. Slowly whisk in the dashi, and continue to whisk until the mixture is completely combined and thickened. Whisk in the cashew cream, and continue to whisk until it thickens slightly more. Whisk in the mirin, and remove the cream of mushroom soup base from the heat. Salt to taste, and set it aside for now. 5. Heat 1 teaspoon of the oil in a large skillet over medium heat. Add the onions, and cook them, stirring often, until they just begin to soften, about 3-5 minutes. Add the fresh mushrooms, chopped shiitakes, and a couple pinches of salt, and cook the mixture, stirring often, until the mushrooms have released their liquids, and start to brown. Once done, carefully transfer the vegetables to the cream of mushroom soup base. Taste the mixture for salt, and put it aside. 6. Return the skillet to medium heat, and add the remaining oil. Once the oil is hot, add the poblanos and vegan bacon, and cook the mixture until the peppers begin to soften, just a few minutes. 7. Add the green beans to the skillet, and use tongs to carefully toss them with the peppers, vegan bacon, and oil. You don't need to fully cook the green beans, you just need to heat them up and cook out some of their moisture. Continue to cook and toss the green beans for just a few minutes. 8. Remove the skillet from the heat. And a couple pinches of salt, and 1 cup of the crispy fried onions to the green beans, and toss them to combine. Add the cream of mushroom soup and non-dairy milk, and carefully fold the ingredients to combine. I know that the skillet is really full at this point, but you can do it! Top the casserole with the remaining crispy fried onions. 9. 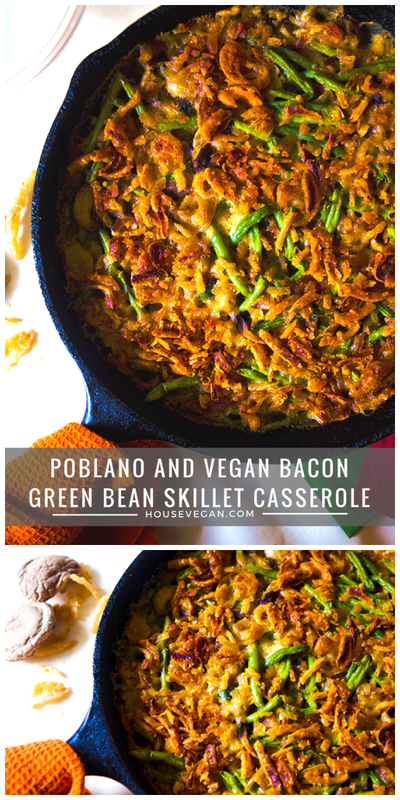 Cover the Poblano and Vegan Bacon Green Bean Skillet Casserole with foil, and place it in the oven to cook for 20 minutes. Remove the foil, and cook for an additional 5. 10. Serve warm by itself or with your Thanksgiving meal.